It’s not easy at the bike shop to hand a customer the keys to a new motorcycle. Bikes are so complicated these days that there’s a lot to explain, and some customers are more demanding than others. 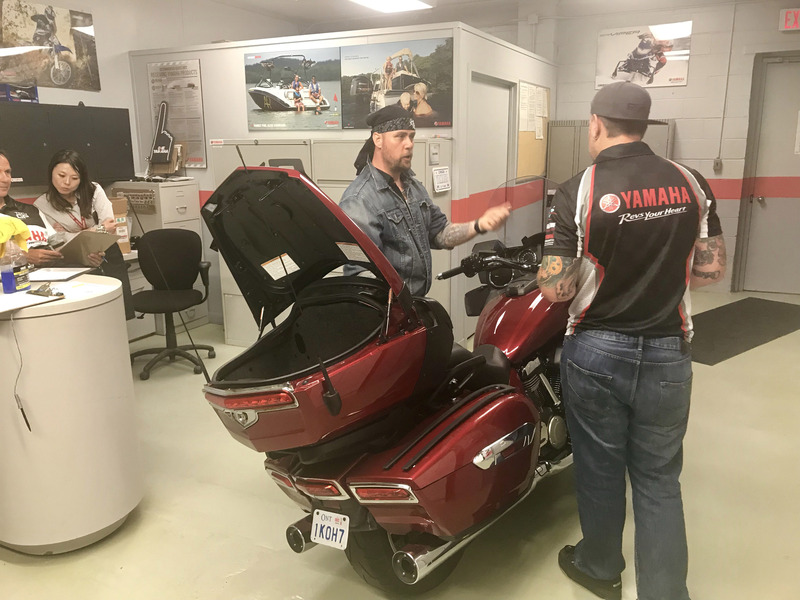 Last week, I watched Yamaha technician Scott Szollos, of Toronto’s Snow City Cycle Marine, give the keys of a $32,000 Star Venture TC to its new owner, and he was peppered with questions. “What’s the extended warranty on this bike?” asked the customer. “How does the key fob work?” And “What’s the weight limit on the passenger seat? I mean, my girlfriend’s not a problem – she’s only this big,” and he held his brawny hands close together, “but my wife – well…”. To his credit, Scott promised to find out the details of the warranty, and he properly demonstrated the fob and the spare key. As for the weight limits, he found the specs in the owner’s manual and showed them to the new owner, whose name was Biker Bob. Rob Dyer, in denim, grills Scott Szollos on the Star Venture TC, as a couple of judges look on from the side. 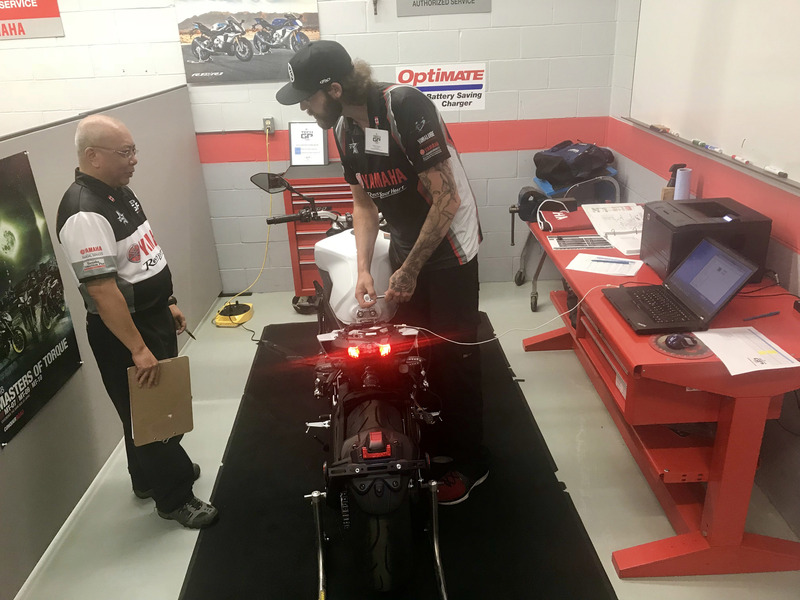 In fact, Biker Bob was really Rob Dyer, “the accessories guy” at Yamaha Canada’s head office in Toronto, and he was putting Scott through the wringer as one of nine tests in Yamaha’s 2018 Technician GP. This is a contest Yamaha runs internationally every two years, and the winner of each national contest gets a trip to Japan this October to compete against all the other country winners. We wrote about it here last week, with the results. Scott came second out of the eight finalists — congratulations! 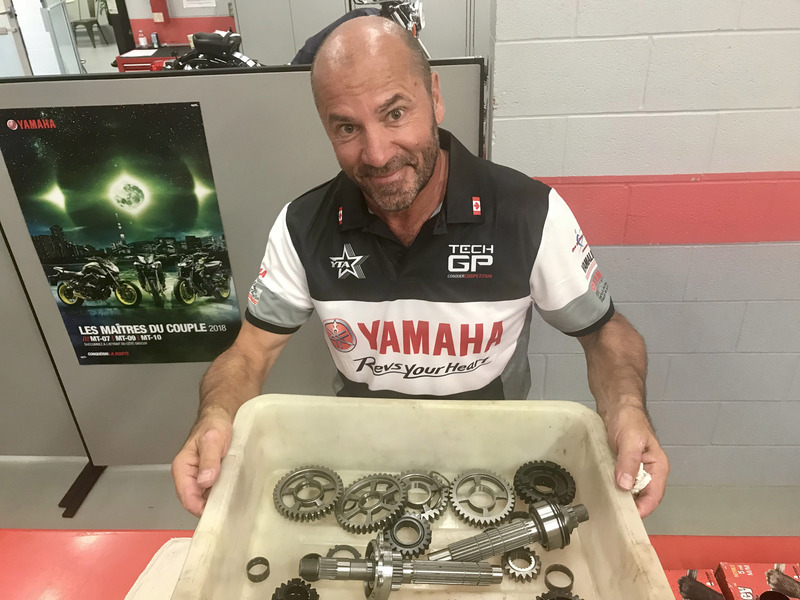 Jim Dorval, Yamaha’s service manager for Central and Eastern Ontario, shows the R1 transmission that needs diagnosing and rebuilding. There were some really tough challenges in the Tech GP. 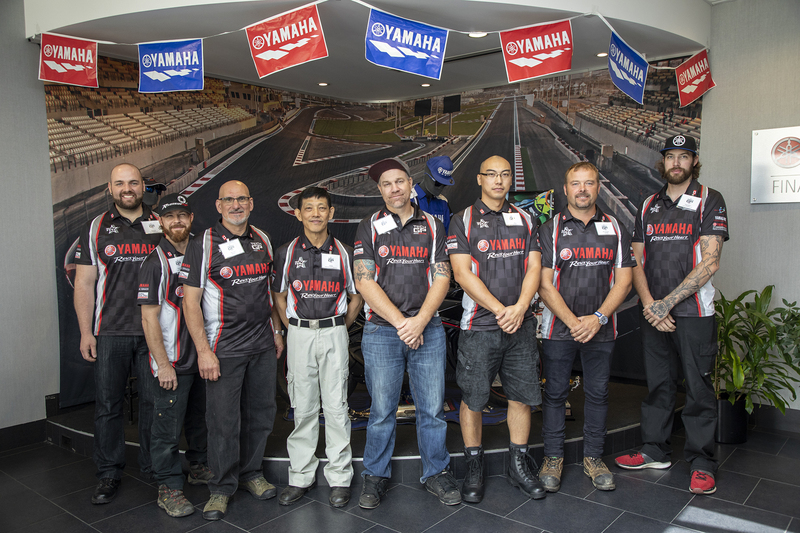 Each of the eight contestants, chosen by online exams from about 700 certified Yamaha technicians around the country, had 30 minutes for each test. They had to figure out why a bike wouldn’t start, of course (and do it the correct way – not through luck), but also accurately measure components, fix wiring, and even diagnose and completely rebuild a faulty R1 transmission from a box of parts. They needed to be as adept with a computer and a smartphone app as with a torque wrench and a pair of calipers, and then some. Brett Hart, of Blackfoot Motorsports in Calgary, gets down to business on his way to winning the Canadian contest. “I was going to be a doctor. My parents wanted the best for me, and they were really pushing me for a high-paying, fancy job,” said Brett Hart, a master technician at Blackfoot Motorsports in Calgary. “But some of the things I really cared about were in motorcycles, and I thought that maybe I could be a motorcycle doctor instead. He’s respected now — Brett won the Canadian contest and is off to compete in Japan in October. In fact, the irony is there are plenty of well-paid jobs for well-trained technicians who don’t mind getting their hands dirty. A technician can’t be outsourced to India or China, after all. 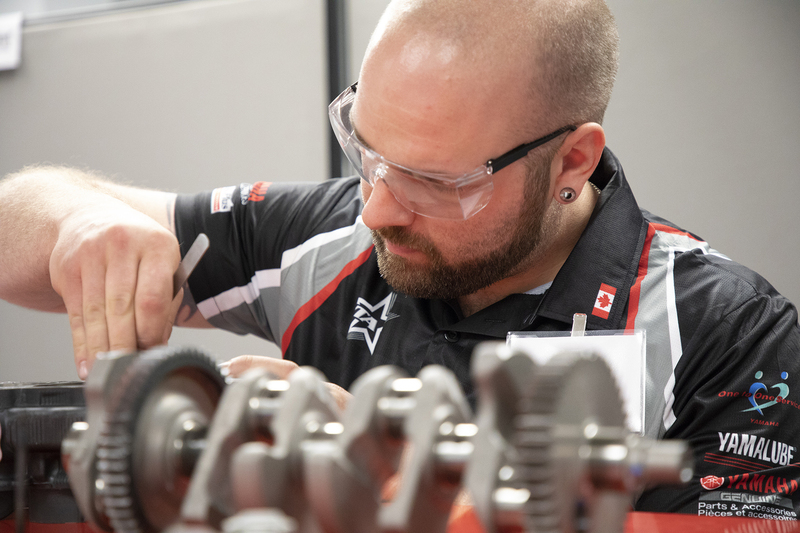 Patrick Gibson, of Cycleworks Red Deer, tries to diagnose half a dozen problems while judge Star Yee, service manager for Alberta and Saskatchewan, checks his methods. Gibson eventually placed third in the competition. When Oakville Yamaha closed its sales and service business last year and laid off technician Luke Pakkala, it didn’t take long for him to get another job at Argyll Motorsports in Edmonton, following his wife there for her tenure-track position as a university professor. 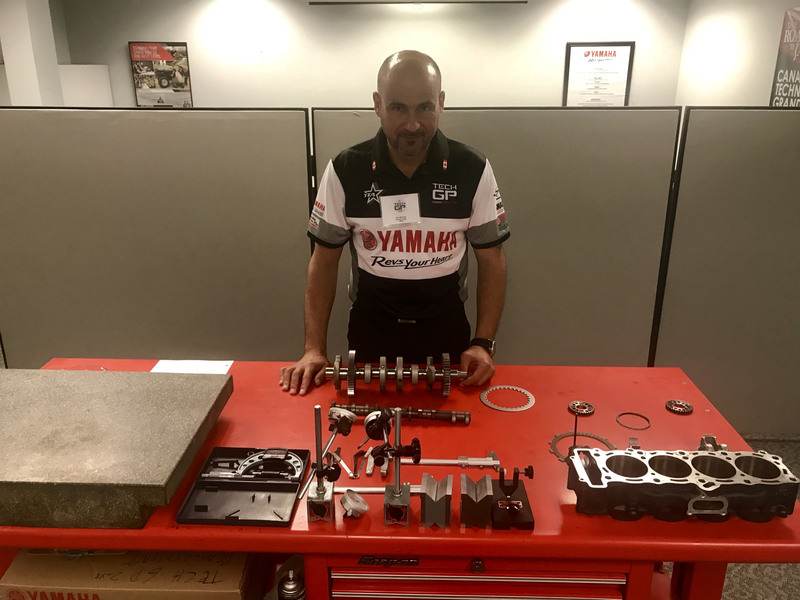 Judge Artur Marques, Yamaha Canada’s dealer service support coordinator, with some components that need measuring and checking for faults. It helped Luke that he won the 2016 Canadian Tech GP, and came second that year in the Japanese contest. In Japan, there were only four tests, but the international contestants had to diagnose and fix a broken motorcycle and then explain it all to the bike’s “owner.” Everything there, said Luke, was dialled up to 11. But what’s the prize? Did he win a million bucks? A pay raise, at least? The eight finalists in Toronto. Left to right: Brett Hart, Rob Daye, Alain Piuze, Quang Le, Scott Szollos, Xin Ji, Mark Schroeder, Patrick Gibson.